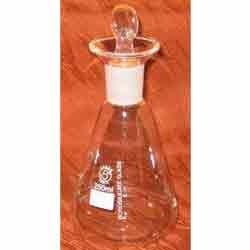 Depending on our best-in-class manufacturing unit we are offering Glass Iodine Flask. This range of products is manufactured using quality-tested raw material and latest technology. This array of flasks does not beak easily. Exclusively used in various chemical laboratories, our flasks are manufactured under the vigilance of our expert quality controllers. We also also assisted by a state-of-the-art warehousing unit to store our products with utmost safety. We, "Sabar Scientific" was incorporated in the year 1972 and since then our organization is manufacturing, supplying and exporting an array of Laboratory Glassware and Equipment. Under this category of products we are offering Fractional Distillation Unit, Glass Blown Apparatus, General Laboratory Consumables, Laboratory Glassware, Laboratory Burette, Vacuum Evaporators, Plastic Labware, Laboratory Flasks, Process Plant Equipment and many more. For offering products with strict adherence to international norms and standard we have achieved ISO 9001:2008 certificate. The infrastructure our organization is robust and sprawling over a huge area. Owing to our worldwide reputation we have been able to expert our products to the international markets of East Asia, Middle East and South East Asia apart from Indian Subcontinent. Some of our highly esteemed customers are Zydus Group (All over India), Weatherford Laboratories, Australia, Cadila Pharmaceuticals Ltd, Gujarat and Torrent Pharmaceuticals Limited, Gujarat.